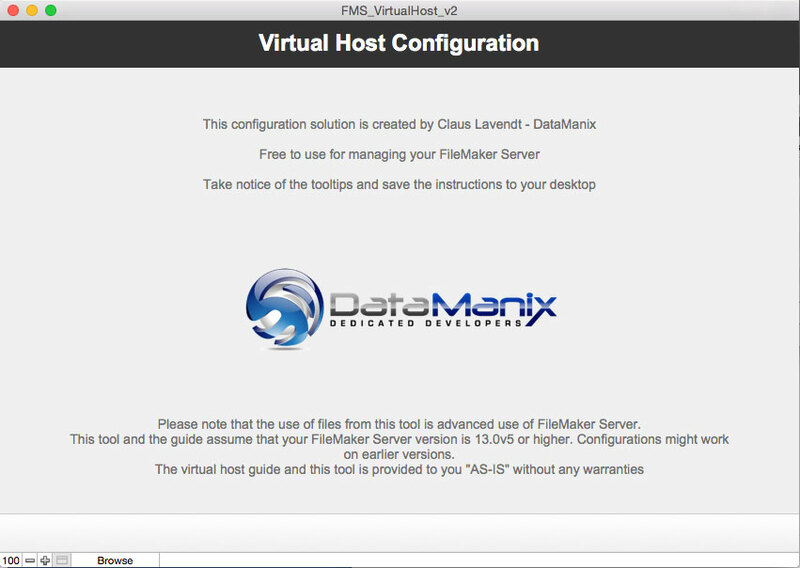 By popular demand, we have updated our Virtual Host guide and tool for FileMaker Server 13+ on Mac. The new guide will work with FileMaker Server 13.0v5 and higher. There are several new tips and tricks included in the “goodies” section. The new tool is now completely unlocked and does not use plugin anymore. Also new in this version is support for SSL. With FileMaker Server 13 we got a lot of great new stuff. However, the installation of FMS13 will take over the Apache webserver on a Mac OSX server, which will prevent you from using the built-in web tools in Mac OSX ServerAdmin. Many people will have a need to be able to create virtual hosts for especially CWP solutions. Please be aware that FMI strongly advice you to only use a dedicated machine for FMS. As FMS13 takes over the Apache settings, there is no native way to configure Virtual Hosts, using GUI tools on Mac OS X. Due to this change, I have created a guide, with an accompanion FileMaker solution, that gives you the ability to configure Virtual Hosts. It can be used for a lot of things and also give you the ability to e.g. create an alias, that takes the user directly to a WD solution, without showing the WD homepage. e.g. www.mycompany.com/wd can take the user directly to the WebDirect solution. It is also possibly to specify the web folder path, so it can e.g. be stored on another hard drive. Using this guide, you can make the setup within 10 min. In this version, SSL sites is not supported. This is due to some heavy re-write rules in the configuration, which I have not been able to find an easy way around yet. Feedback is greatly apprechiated, both here and via email. This guide is not official supported by FMI, so any use is on your own risk. 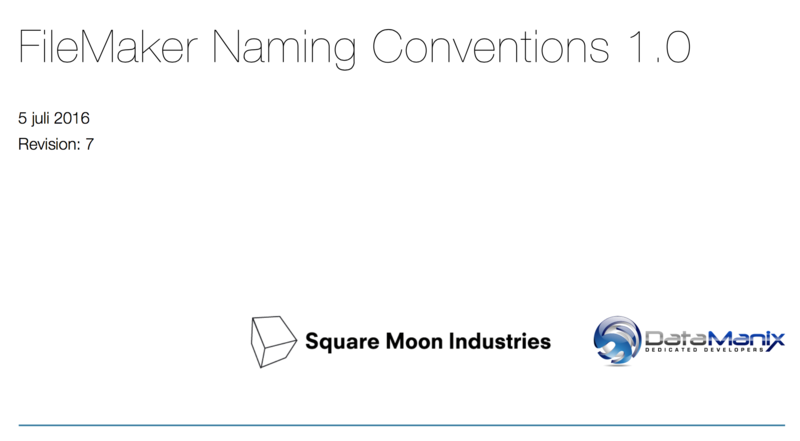 We have created a naming conventions document in collaboration with our great colleagues at SquareMoon Industries. The way these conventions sets themselves apart from many others, is that they are meant to be limited to a few rules and mostly guidelines. This should make it more easy to follow and not lock the developer into a very specific way of developing. We publish these conventions to the community in the hope that others would like to adopt them. The more, who adopt, the easier it will be for new developers to get into FileMaker development and the easier it will be for us to collaborate on projects. The conventions will evolve over time, so please check back later to see if we have made any updates. If you are digging into DevCon2Go16 for the international FileMaker Developer Conference or any of the european conferences, these conventions was used to create this app. If you want to want to get more great content, tips&tricks, be sure to follow @DataManix at twitter, linkedin or facebook for announcements. Also, look out for upcoming announcements on updated examples and our new blog site.